Bushwillow is located in Kuleni Game Park. 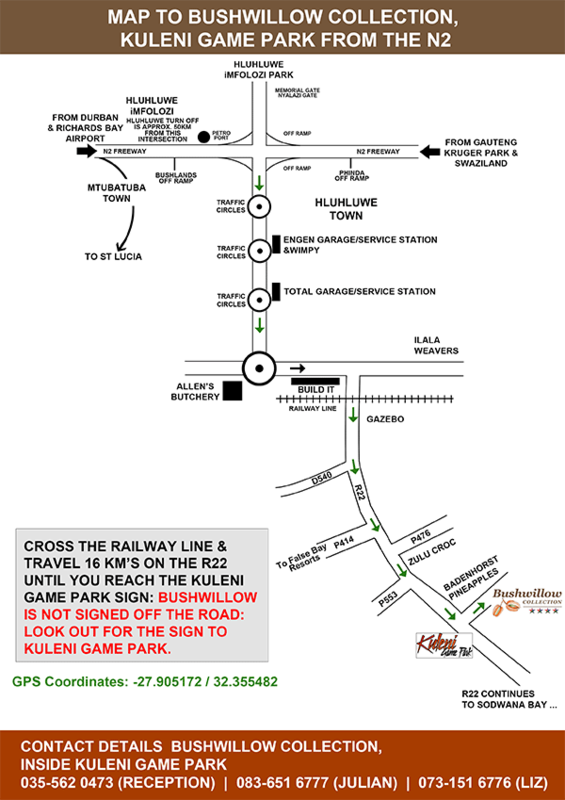 There are no signs to Bushwillow off the roads, so be sure to look out for the Kuleni Game Park sign. BE WARNED: The GPS units in your cars or on your phones will often take you on the gravel/dirt roads which may be more direct but take much longer! Stick to the N2 until you reach Hluhluwe off ramp and follow the written directions: unless you want a 4x4 experience and/or a dusty ride! From Durban City Centre, find your way on to the N2 and travel North. From King Shaka International Airport there are signs directing you to the N2. Be sure to exit to the North towards Ballito, NOT towards Durban. Continue travelling on the N2 until you reach the Hluhluwe/Sodwana Bay (R22) off ramp. (Look out for the Bushlands off ramp & then the Total Petropoort on your left. The Hluhluwe/Sodwana Bay off ramp is the next major signed off ramp after this). Turn right towards Hluhluwe town at the top of the off ramp. Proceed to the town of Hluhluwe and follow the detailed directions given below. There are several routes from Johannesburg and it is wise to check which route to use since there are often road works on these roads, which can slow you down considerably. Aim for the N2 and travel South towards Mkuze. Turn left towards Hluhluwe town at the tope of the off ramp. Travel South West on the R22 towards Hluhluwe town. Pass Amorello Game Lodge on your right. Approx 2km after Amorello Game Lodge will be the sign for Kuleni Game Park. Turn right along the small dirt road that runs alongside some pineapple fields until you reach the Kuleni Game Park gate. On reaching the gate, the gate guard will ask you to sign an Indemnity Form and he will then direct you to Bushwillow (please inform him if you are staying at the lodge, boutique or cottage).